Calling all UFC bantamweights. Sarah Kaufman (pictured) is in desperate need of a new opponent on April 16 after Shayna Baszler was forced out of their scrap with an undisclosed injury. The Ultimate Fighter Nations Finale takes place inside Colisée Pepsi in Quebec City, Quebec, Canada. Baszler was looking to make her official UFC debut after appearing as a contestant on “The Ultimate Fighter 18.” She’s alternated between wins and losses over her past four outings. Kaufman, meanwhile, initially dropped a split decision to Jessica Eye in her big league premiere. However, that October tango was overturned to a no contest after Eye flunked her post-fight drug test due to marijuana. 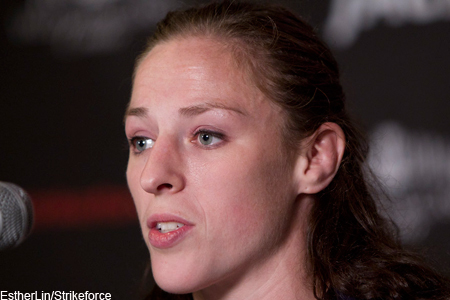 The veteran is itching to get her first UFC win under her belt. “What lady is stepping up with @QoSBaszler out? Come try to beat up a Canadian! !” Kaufman pleaded via Twitter after news broke Tuesday evening.